SAUL PERLMUTTER CHAPTER IS WRITTEN! 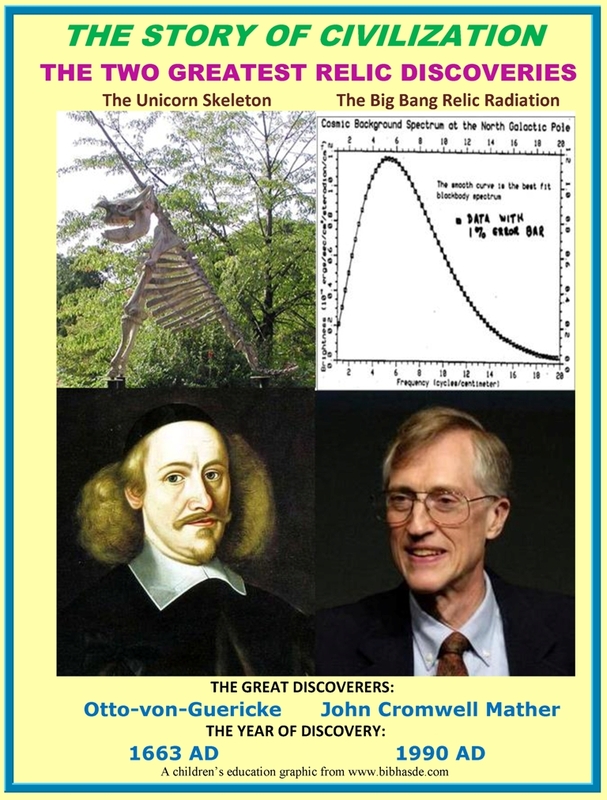 I have now completed a draft of the scientific chapter on Saul Perlmutter for my free eBook. Click on Chapter IV-4. 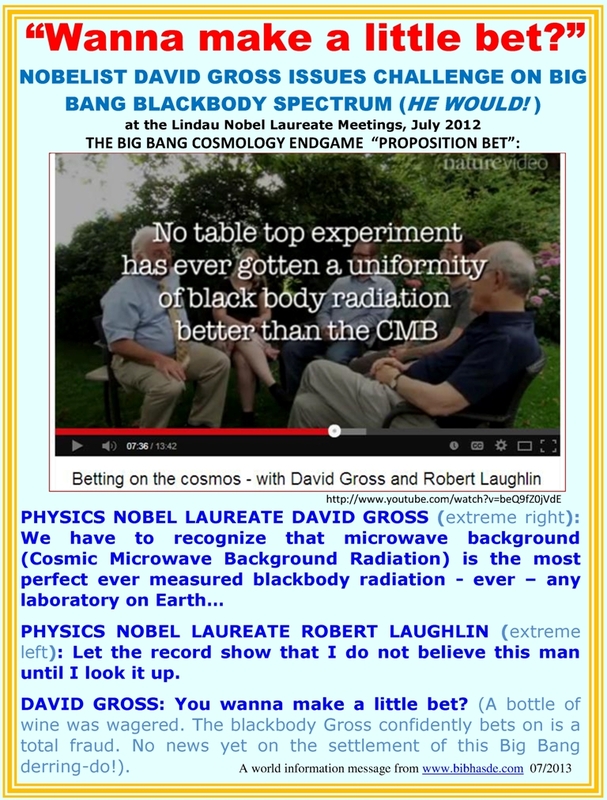 AN ORIGIN OF THE COSMIC MICROWAVE BACKGROUND RADIATION (CMB)? This is just speculation for anyone interested. 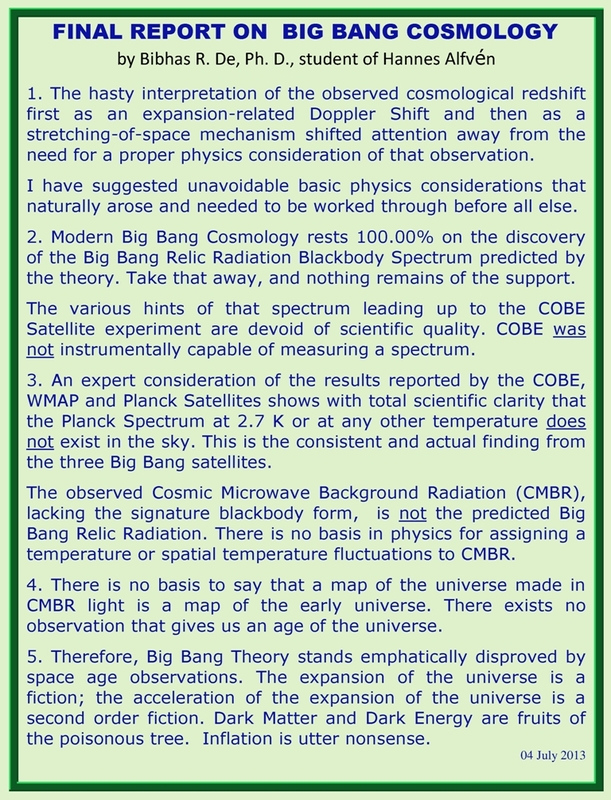 I am not claiming to have found the explanation of the Cosmic Microwave Background Radiation (CMB). 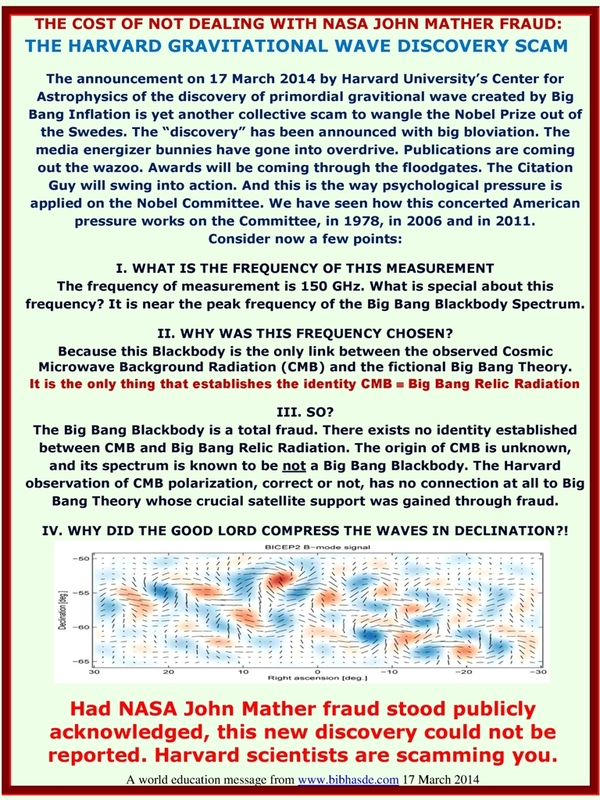 I am only saying that CMB may be a straightforward consequence of what needs to happen in the universe, basic physics wise. In an earlier post I suggested that at extreme inverse square dilution, starlight has to spontaneously shift to lower frequencies (i.e. 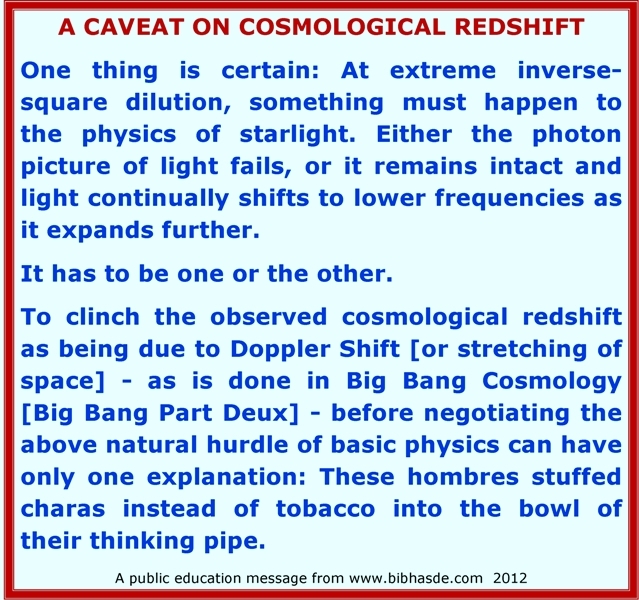 to “redshift”) in order to maintain the physical “structure” of light. There is nothing fancy or highfalutin here. This is just what has to happen. As light leaves a star, everything remains fine out to a radius R from the star. Beyond this the light starts to redshift. There is no motion of any kind involved in this pictue. There is no stretching of space or any such thing involved. Also, this is nothing to do with dust grains, Zel’dovich effect, Hydrogen-to-Helium conversion or what have you. It has to do only with basic physics of light. So, if we (the observers) are within this radius R of a star, we will see the star in the light that it predominatly emits (e.g. optical, radio etc). If we are outside R, we will see the star in the redshifted light. 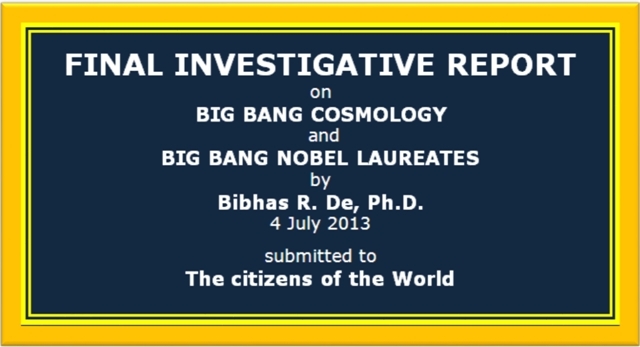 Thus, the light from the more distant star populations today forms a continuum of microwave radiation in the universe. It is isotropic from our viewpoint if the total stellar population (seen and unseen in visual) as seen by us is isotropic. It is pervasive because the stars are pervasive. It is patchy because the star population as seen by us is patchy. 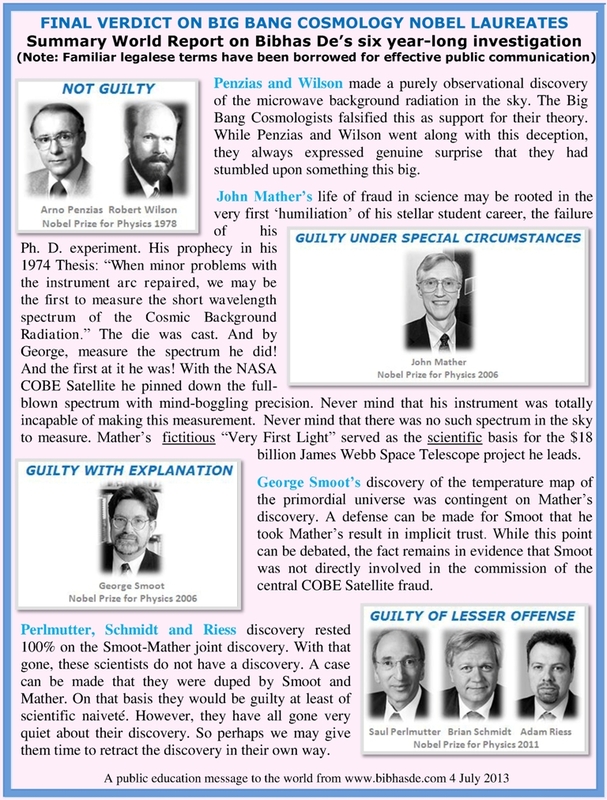 This continuum of radiation has no cause to be thermalized, and it does not have a temperature. 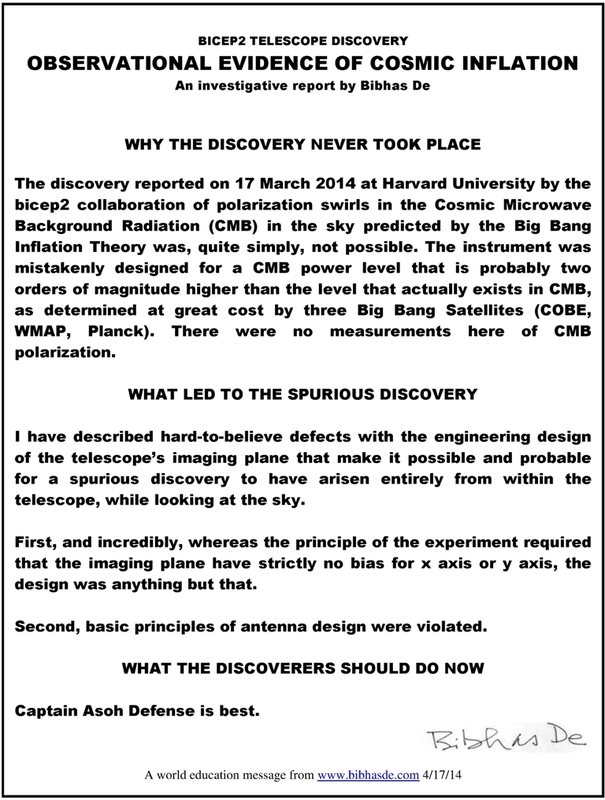 There is satellite experiment evidence today that CMB is not thermalized. 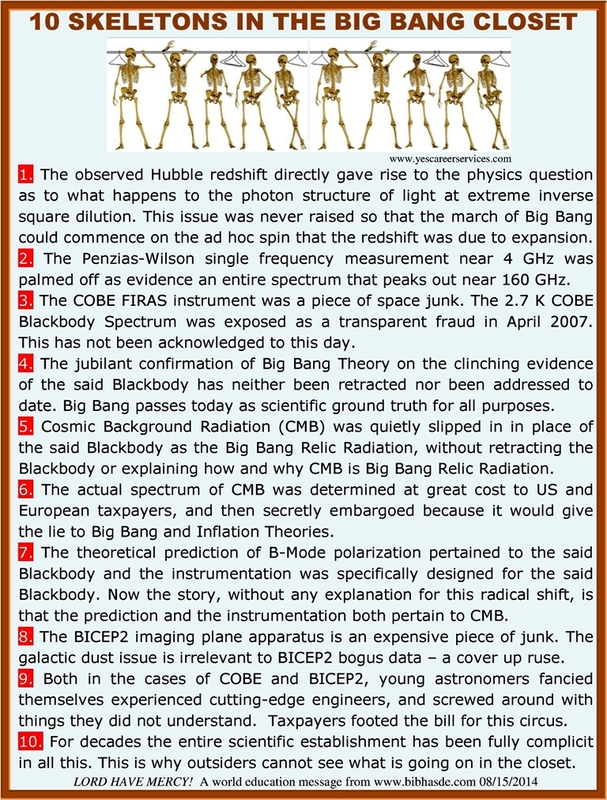 So the CMB is just radiation from stars that we are not seeing today in their original light, beacuse that light has suffered the redshift effect of extreme inverse square dilution. It may be that the universe operates on simple physics after all. 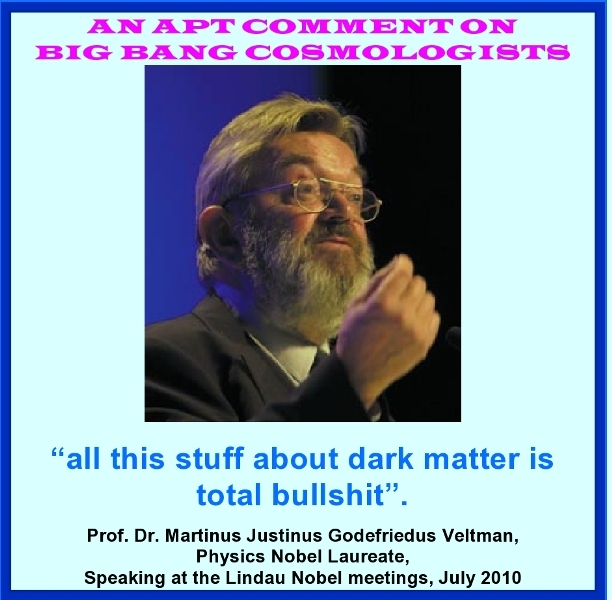 It may be that this was dispensed with and “higher physics” was brought in its place, so that a century-long lucrative science empire could be thrive. 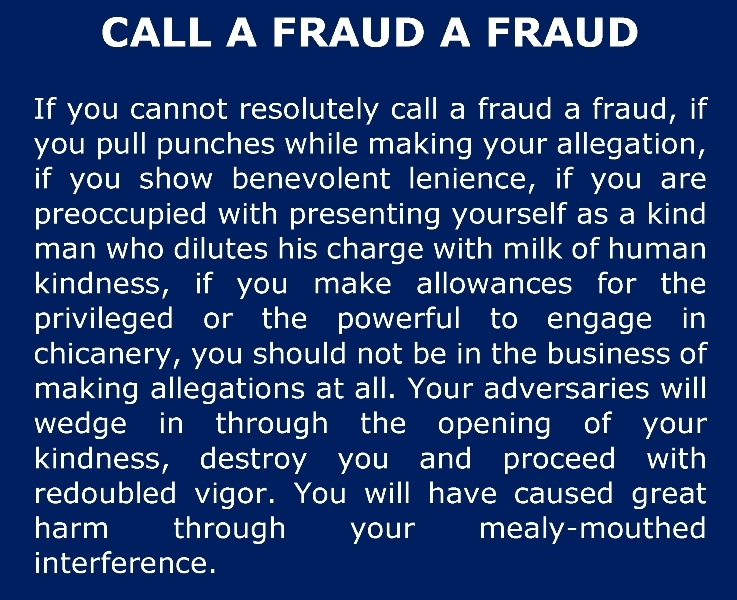 None the wiser. 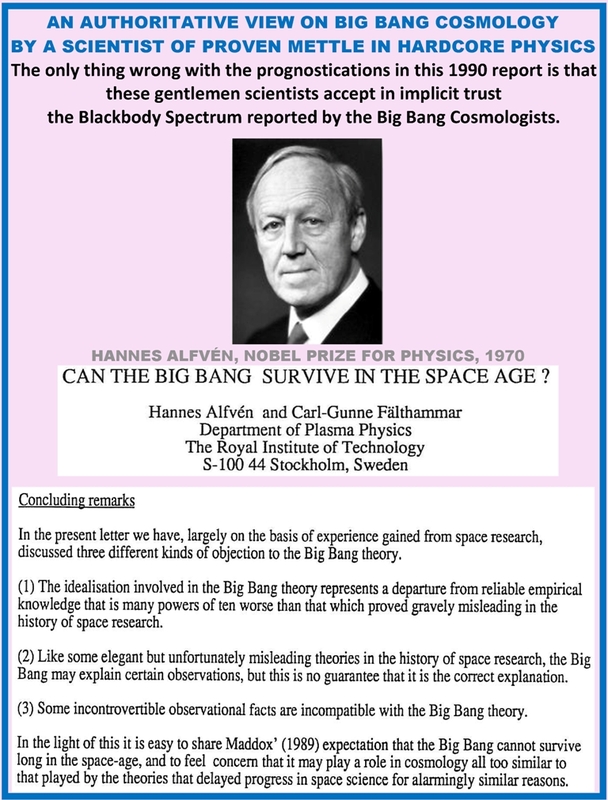 THE LAST OF BIG BANG SCIENCE: Flush it down the loo! 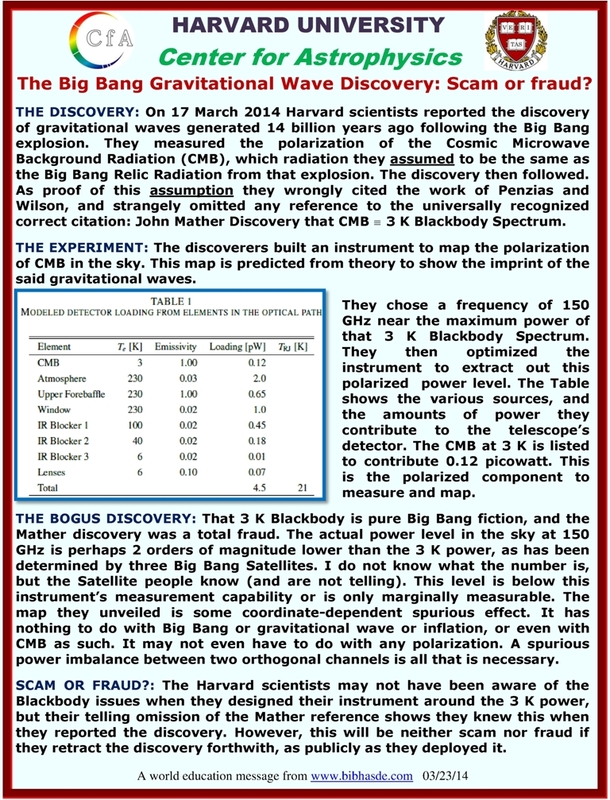 Folks, be wary of dishonest attempts to save Big Bang Cosmology when the strongest support they have prided on and gloried on and banked on and used to beat up the critics with all these decades – the 3 K cosmic blackbody – collapses. Enough is enough! 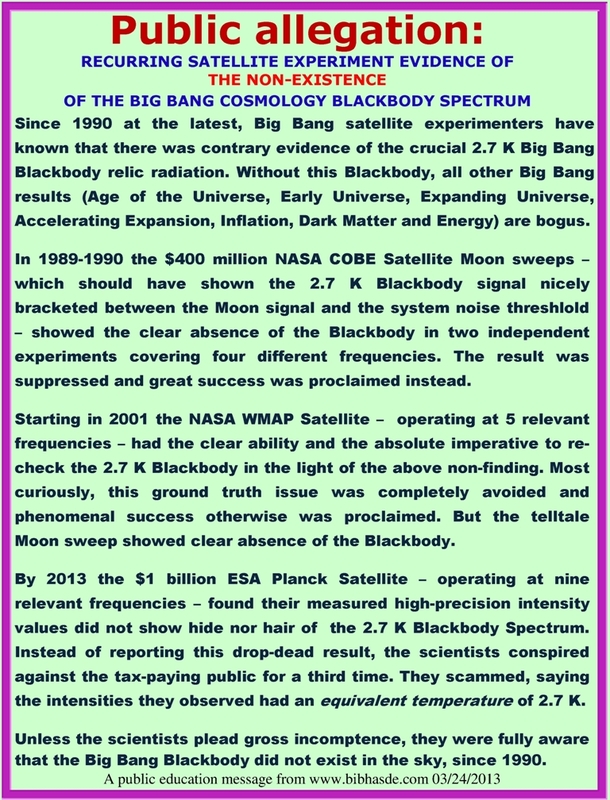 Big Bang Cosmology Theory in free fall, Cosmic Microwave Background Radiation Spectrum (CMB, CMBR), 3 K Cosmic Blackbody temperature, inflation, nucleosynthesis, John Mather discovery, 1978, 2006, 2011 Nobel Prize Laureate for Physics, NASA COBE Satellite, ESA Planck Satellite, nascent universe anisotropy, cosmological redshift, dark matter, dark energy. 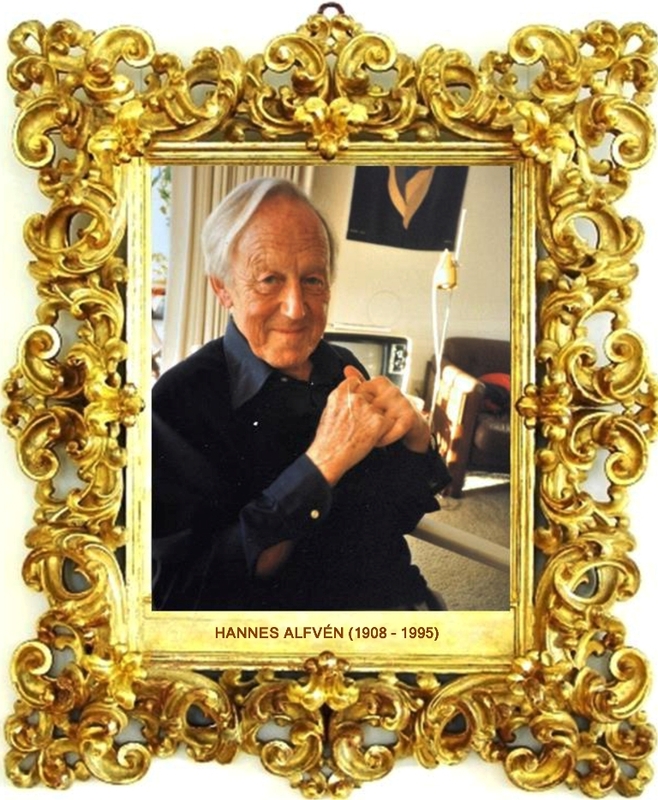 My teacher Hannes Alfvén was not only right, but also prophetic in this statement he made some three decades ago. NASA Big Bang-ers and their cohort outside NASA today are doing some pretty weird pioneering physics, and nobelling on that to boot. 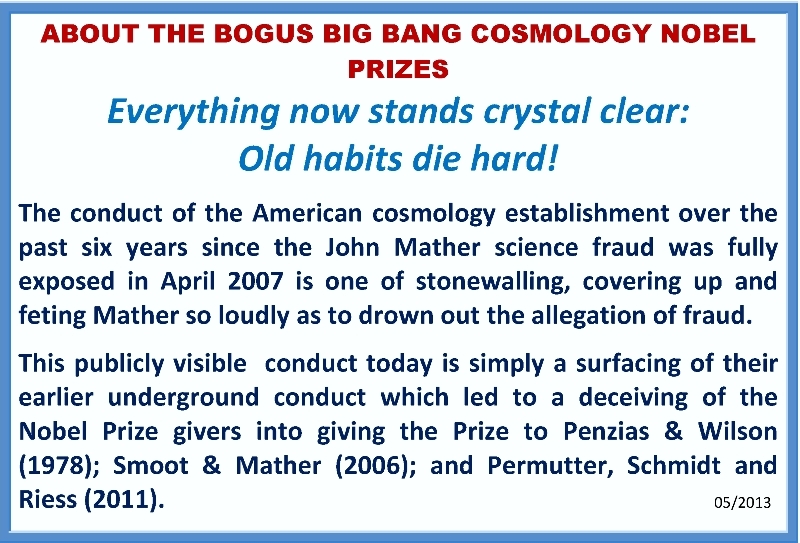 For their own good, the physics establishment needs to crack down on the Big Bang-ers just as the medical establishment cracks down on quacks.